Isaiah Deck (left) finished in third place at a State Wrestling Tournament held Saturday. Franko Cuccurello (right) finished in fourth place. They are joined by their coach Chase Crocker. Two wrestlers from Neuse Charter School in Smithfield placed during a State Tournament held Saturday at the Greensboro Coliseum. Franko Cuccurello placed fourth in the Sate after winning the Eastern Regional the prior weekend. Cuccurello ends with a career record of 109-56. Cuccurello is a two time state qualifier. Isaiah Deck capped of an amazing year placing third in the 170 pound 1-A Division. Deck set the Neuse Charter mark for wins this year going 51-3. Deck ends his career number two in wins going 118-63. 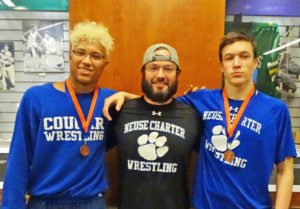 Neuse Charter launched their wrestling program just six years ago.